A few weeks ago I attended a pickling class at an organic farm here in San Diego, and I decided to sample everything available there on principle even if I wasn’t sure I would like it. 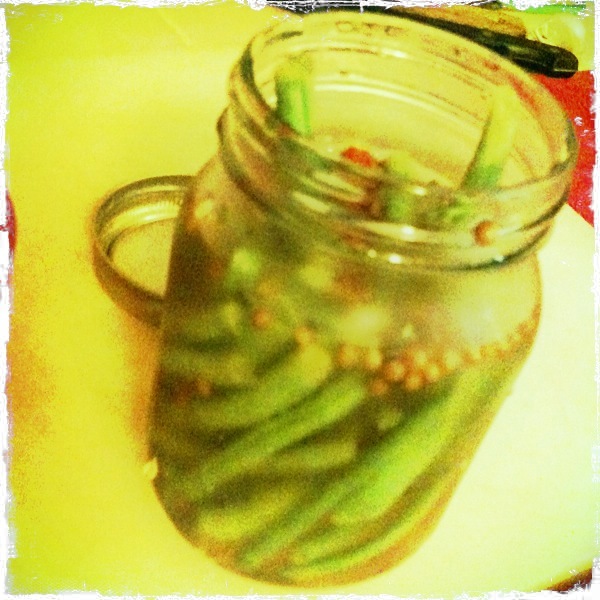 I had never had a pickled green bean before. 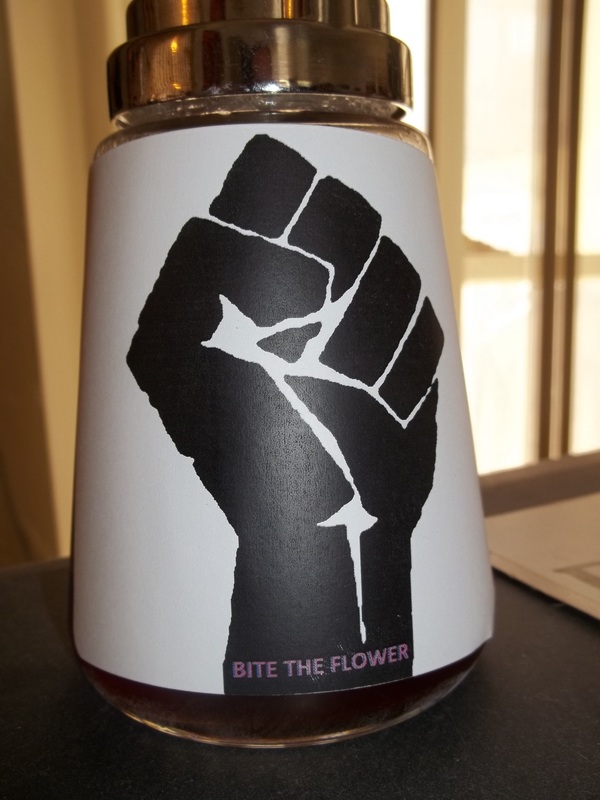 I sampled one available there, and within a few minutes realized I could not put down the jar. They were simply amazing. Very crisp and fresh, spicy and a little tangy, and, despite the fact that they are used regularly in New Orleans as a Bloody Mary cocktail garnish, perfect to simply snack on by themselves. These are a close relative of the traditional dilly bean, the only difference is that a zydeco bean has yellow mustard seeds and usually a little bit more hot pepper. I made a few jars of these for the San Diego Food Swap today and they were a HUGE hit. I noticed that people began to congregate around my table a lot, and they all managed to sample the zydeco beans a few times before we swapped for anything. I also brought some lovely dill cucumber pickles, but once people sampled these, they didn’t want anything else. This recipe is from Linda Zeidrich’s book, “The Joy of Pickling.” If you’re even a little serious about preserving I highly recommend both of her books (she also has an excellent book about jams and sweet preserves). Her pickling book is over 400 pages of recipes for literally every type of produce … even ones you would never dream of pickling. If you just have a garden and want to try new ways to use the mounds of produce on your hands, please invest in Linda’s books. Into 6 pint jars, put 1 sliced garlic clove and 1 tsp mustard seeds. Pack the beans vertically into the jars. To each jar, add 1 to 2 hot peppers and a dill head. In a saucepan, bring to a boil the vinegar, water, and salt. Pour the hot liqiud over the beans, leaving a 1/2 inch headspace. Close the jars and process for 4 minutes in a boiling water bath. Lavender is lovely and fragrant – and abundant at this time of year. It’s wonderful to just pick a few stalks and have their lovely scent waft through your home, but there are also some delicious and healthful ways to use the flower. In addition to being a source of honey and an additive for teas and other herbal concoctions, it also has use as a calming and anti-inflammatory agent. It’s been an ingredient in fine (mostly French) cuisine for centuries. 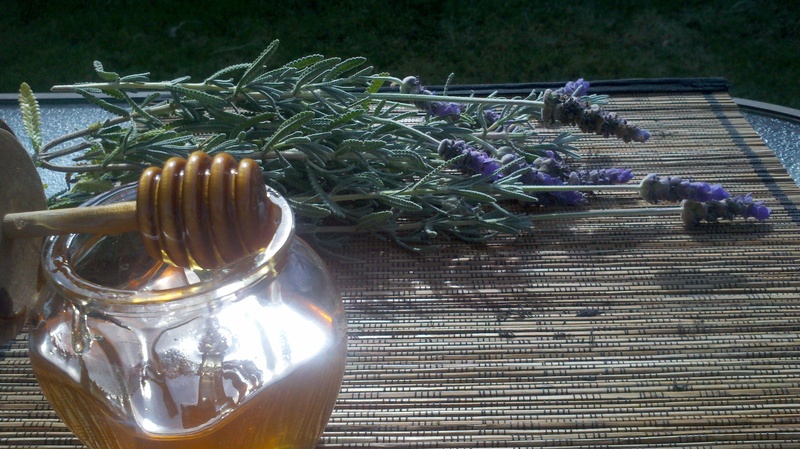 Thanks to Kerrin Hetrick-Friese for the lovely lavender photo! Lavender plants flourish best where it is dry and warm, so once you pick it, all you have to do to dry it is literally have to leave it out for a couple of days — sometimes even less than that. Dried or fresh lavender buds work equally well in this recipe, but the fresh buds result in a more purple tone to your finished product. 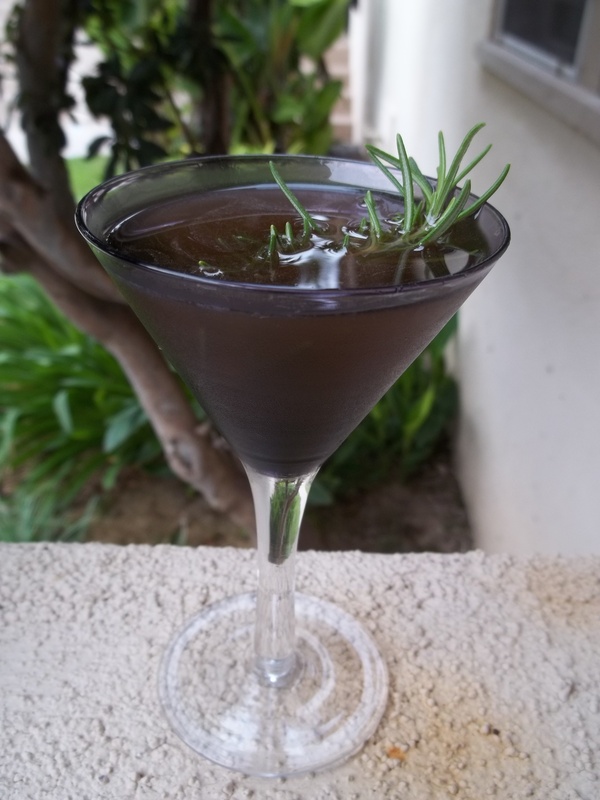 If you use dried lavender, the taste and quality is the same, but you may want to add food coloring to make it a little more lavender in color (say, for a cocktail or dessert), otherwise it has a dark maroon, almost brown, color. Or you can fool them all with a purple-tinted glass! Haha! This is a truly excellent cocktail. Shake one part syrup (recipe follows) to two parts vodka over ice and strain into a glass. Garnish with rosemary or other fresh flowers. The fragrance of rosemary offsets the lavender perfectly. 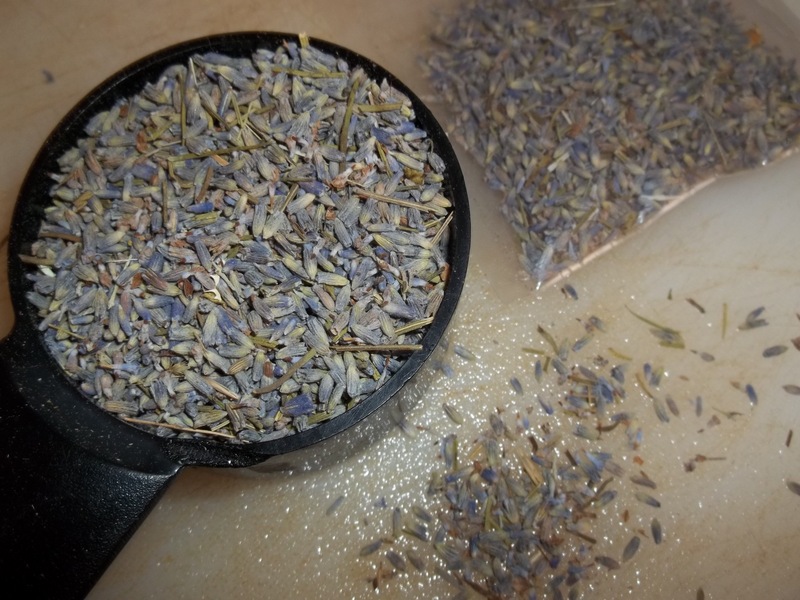 You can use dried or fresh lavender for this recipe. This syrup is very simple to make and can be used with cocktails and delicious summer drinks — try a few spoonfuls in a pitcher of iced tea or lemonade for a dash of sweetness and flowery flavor. Or enjoy it drizzled over ice cream or a nice warm pound cake. I have also heard that a spoonful before bed helps you to relax and sleep without the need of prescriptions or medicines. If you have trouble sleeping — or maybe just need to mellow out after a long day — try a spoonful of this syrup, by itself or in a drink or dessert. Bring the flowers and water to a boil in a pot, and allow to simmer for about 3-5 minutes. Strain the flowers out of the pan (a slotted spoon works well for fresh flowers, but if you use dried flowers you may want to strain this through a cheesecloth or jelly bag to get all the buds out) and add sugar. Simmer over medium high heat until the mixture reaches a syrup-like consistency (about 10-12 minutes). Allow to cool completely before putting it into a storage container (I bought a syrup bottle and made the project into an homage to my favorite hip-hop group). If you decide to can them, use a pressure canner to seal the jars.